Seven years ago today began as any other day, well, at least to a 16 year-old. High school. Still on my learner’s permit for driving. I remember driving the red Dodge Dakota my grandmother still owns from school (Mammaw in the passenger’s seat) to the hospital. My dear grandfather, Pappaw, had been admitted because he was having breathing problems. He’d been through so much before, including several heart attacks, that no one–not even the doctors–expected him to be there for very long. I was anxious to get home because I had a calculus test the next day that I wanted to study for. Pappaw seemed to be doing fine. My parents came by his room after work and I was ready to go home with them. Mammaw said she’d stay the night with Pappaw. I remember I had a cold. I hugged Pappaw goodbye, but kept my distance because I didn’t want to get him sick. That was the last time I ever saw my dear Pappaw. That night was a rush of emotions and is kind of blurry in my head, but I still remember the gut-wrenching pain of losing someone you love. I’d never known anyone to die before, especially no one that I was so close to. My grandparents practically raised me as much as my own Mom and Dad. 1 ) Swinging in the front yard under the shade tree Pappaw always sat under. 2 ) Finding worms under Mammaw’s garden bricks in the ground to use for fishing in the pond…and then only ever catching bluegills. 5 ) The time Pappaw caught a garter snake because he thought I’d like to see it or keep it. I’m not quite sure what he was thinking. He took it outside of the jar to hold it and tried to convince me to hold it, but the little snake’s mouth was just wide enough to stretch over his thumb. Pappaw shook his hand violently to try to get it to let go, the snake’s body flailing back and forth. This was all INSIDE their house…we were afraid it was going to get loose. Oh, Pappaw. 6 ) When Pappaw made me cool things out of random supplies. He made me a sling-shot out of a Y-shaped branch he whittled as the frame and an old piece of leather from a boot as the “launcher” part. He also made me a bow out of a flexible tree branch, and I found an old arrow of my uncle’s that I would shoot across the yard. 7 ) Coincidentally, that reminds me when I bought myself a BB gun and Pappaw “tested it out” by shooting it at his own garage…and his mailbox. Classic Pappaw. 8 ) Tattling on Pappaw to Mammaw when I was little. I caught him smoking several times in the garage. Mammaw had wanted him to quit, and I knew it was bad for him–as all little kids seem to know. He also used chewing tobacco. I knew what it was, but I wanted to see what he’d say when I questioned him. “What’s that in your mouth?” I’d ask. “Black chewing gum.” he’d reply. 9 ) Sitting outside next to Pappaw and his neighbor, James Riley, and listening to the two old men try to one-up each other in how big their produce from their respective gardens were. P.S. 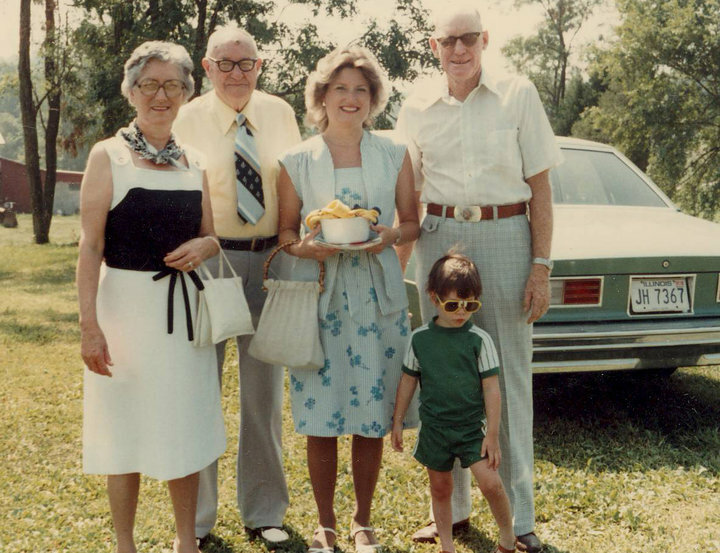 Relatives who read my blog…got any good Pappaw memories??? Oh, and Aunt Bobbie/Shellie/Mom–I’d like a picture of me and Pappaw if you all happen to have one next time I come home. I don’t have ANY with him and me. I can’t believe it’s been seven years. I’ll look for some photos. Well you had me crying and then laughing. How well I remember those songs also. My birthday is next week and every year I would hear him tell about the day I was born–how the truck got stuck in mud on the way to the hospital and mom having to help him get it unstuck and about there being the first killing frost the next morning. I remember daddy always loving to kid people–especially any friends I brought home. I don’t think he ever met a stranger. On that note, I do believe mom always fed every salesman or stranger that stopped by or at least tried to. Thanks for replying! I love hearing stories. Maybe we can share more at Christmas! I have picture of Pappaw holding you at the age when Aunt Bobbie made the pics of you holding JellyBean. You have on the same outfit. Also one of you and Pappaw and you are on the spring rocky horse. I meant a more recent picture.